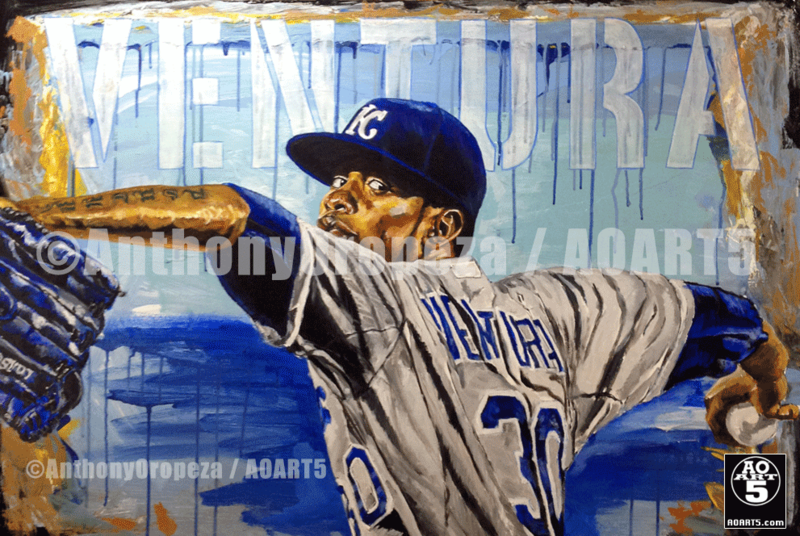 A piece created with a heavy heart by Kansas City Sports Artist – Anthony “AO” Oropeza. The early and tragic death of the young Dominican-born phenom, and the devastating effect it has had on the Ventura family, the Royals family, Royals Nation, both Kansas Cities and AO, has been an emotional one. With an original art piece already in the works of recently departed Marlins pitcher, Jose Fernandez, AO felt is was only right to create a piece for a member of his hometown team. This piece was created with the hope of finding a way to get a copy of the original to the Ventura family in the Dominican Republic. 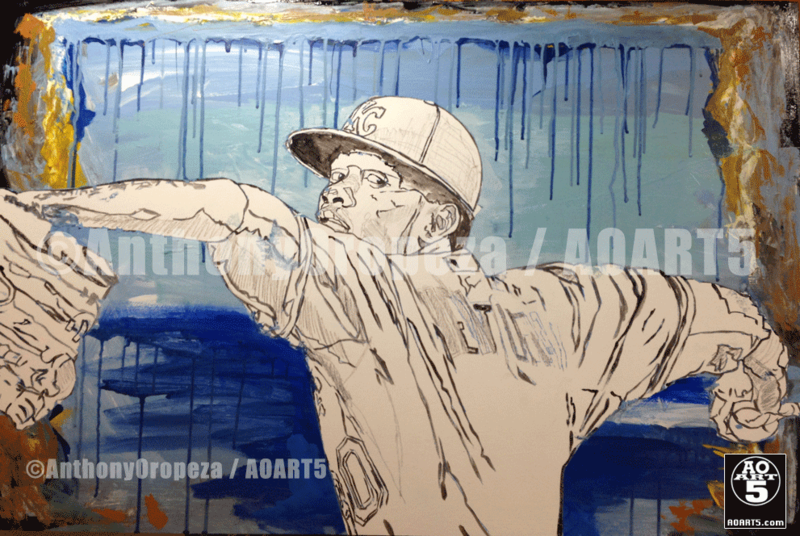 And if by chance anyone was to purchase the original, a portion of the proceeds would go to the newly founded baseball academy in the Dominican on behalf of Yordano. With no intention to sell the original, AO was approached by two of Yordanos’ Royals teammates (Jarrod Dyson and Eric Hosmer), and eventually was acquired Mr. Dyson and special prints created for Mr. Hosmer. AO is so honored that the original piece is now owned by one of his Royals brothers. The piece was completed mid-February of 2017. AO was honored that one of the prints purchased by Mr. Hosmer was intended to make its way to the Ventura family. After finding this out, AO created another print and gave it to Mr. Hosmer and the team as a gift. AO hopes that the home town of Yordano will feel the love and supports from his home-away-from-home, and that the fans in KC cared about this very talented young man.